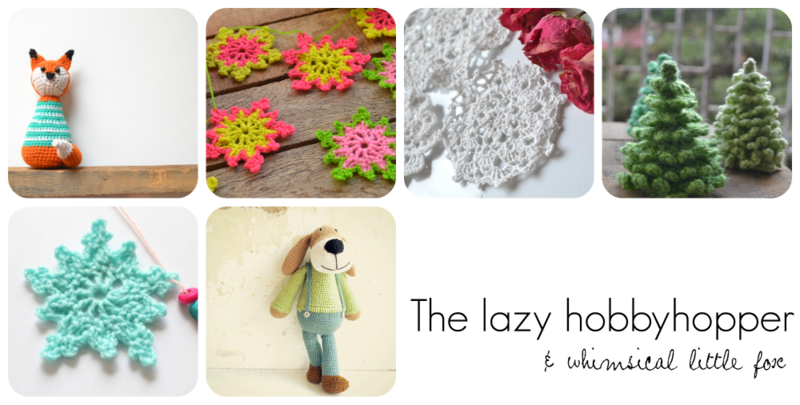 I have a free pattern for you - after a long time. Of late I have been designing only amigurumi and I'm loving it. 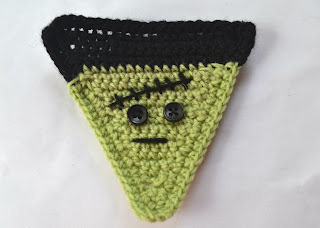 Before starting my next doll pattern I thought I would design something free for you and since it's the Halloween season what else can I think of other than a Halloween themed pattern? 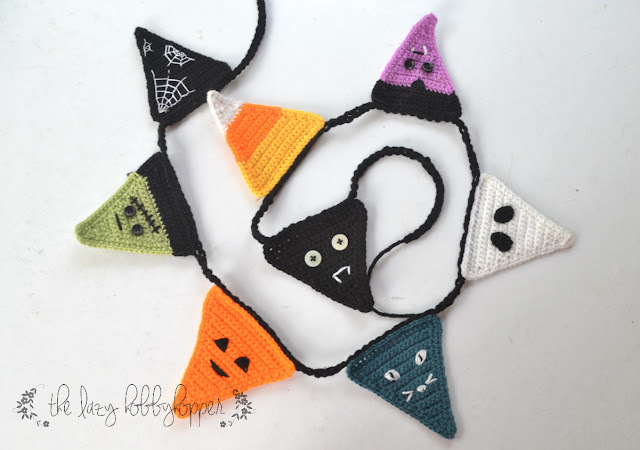 I chose to make a bunting since it is the best way to include as many Halloween characters as possible in one pattern. 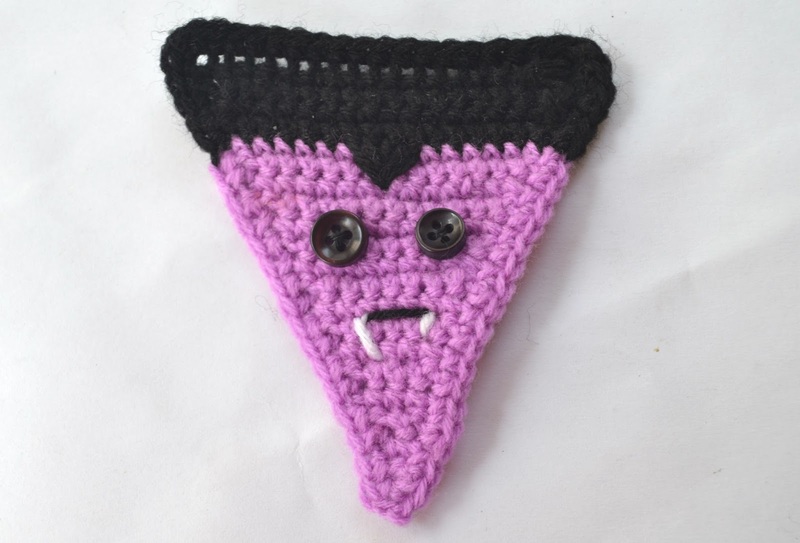 I made 8 triangles. 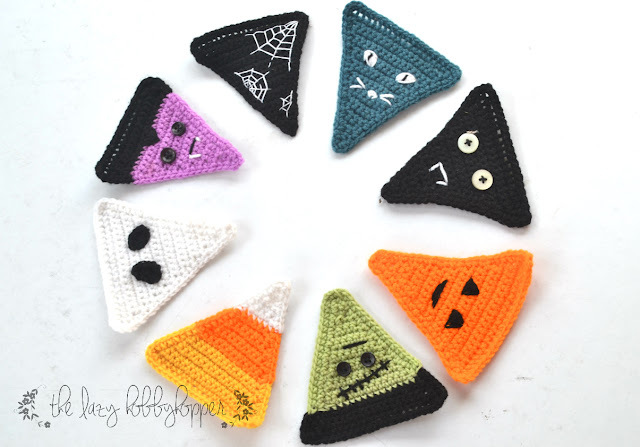 Each triangle measures approximately 3.5 inches wide and 3.5 inches high. 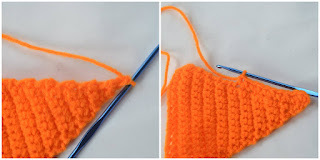 Note: Ch 1 at the beginning of a row will not be counted as a stitch. 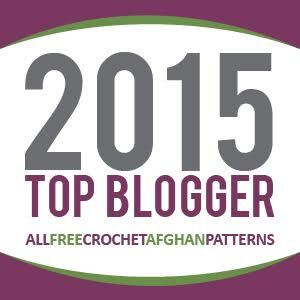 This is the basic pattern you will be using for all the triangles with variations in color. Row 3: Ch 1, sc in each st across (18). Turn. Row 6: Ch 1, sc2tog, sc in 12 sts, sc2tog (14). Turn. Row 8: Ch 1, sc2tog, sc in 10 sts, sc2tog (12). Turn. Row 10: Ch 1, sc2tog, sc in 8 sts, sc2tog (10). Turn. Row 12: Ch 1, sc2tog, sc in 6 sts, sc2tog (8). Turn. Row 14: Ch 1, sc2tog, sc in 4 sts, sc2tog (6). Turn. Row 16: Ch 1, sc2tog, sc in 2 sts, sc2tog (4). Turn. Row 18: Ch 1, sc2tog twice (2). Turn. Row 20: Ch 1, sc2tog (1). Turn. Row 21: Ch 1, sc uniformly along the sides of the triangle working 3 sc at each corner. Join with a sl st to the 1st sc. Fasten off. 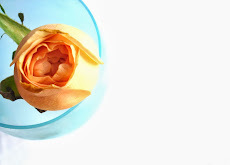 Follow the basic triangle pattern using orange. Using black thread embroider eyes and mouth. Follow the basic triangle pattern working first 7 rows in yellow, next 7 rows in orange and the rest of the rows in white. 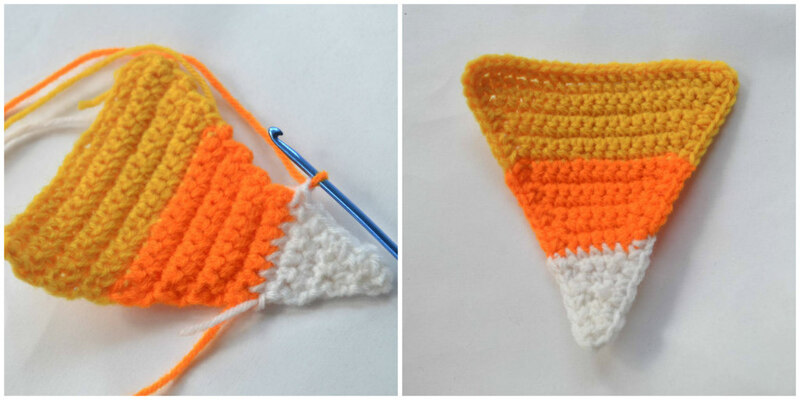 While working sc along the sides of the triangle switch to orange for the orange part and yellow for the yellow part. Follow the basic triangle pattern using white. Eyes (make 2): Using black ch 4, sc in 2nd and 3rd ch from hook, 3 sc in last ch, sc in next ch on the other side, 2 sc in next ch. Join with a sl st to the 1st ch (8). 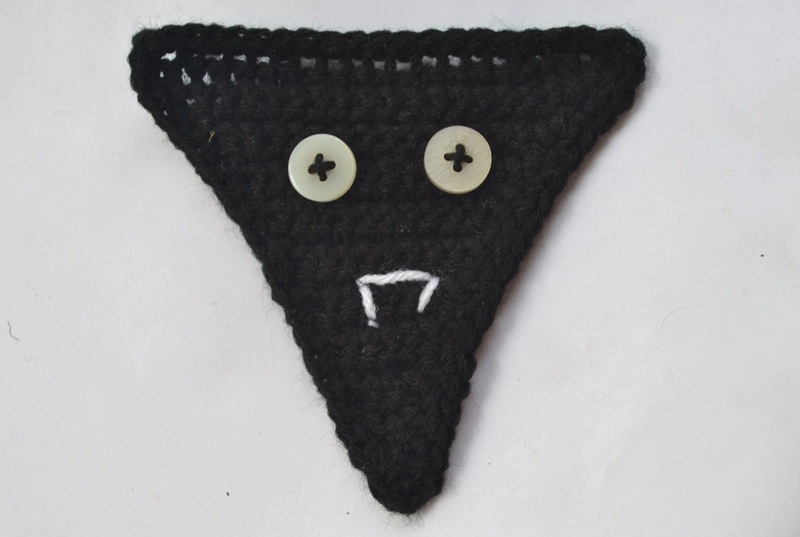 Sew the eyes on the triangle as shown. 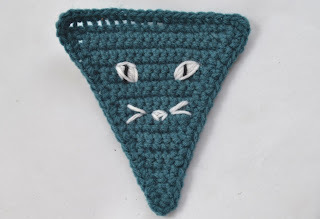 Follow the basic triangle pattern using black for rows 1 to 4 and lilac for rest of the rows, sc along the edges using lilac yarn for the lilac part and black for the black part. 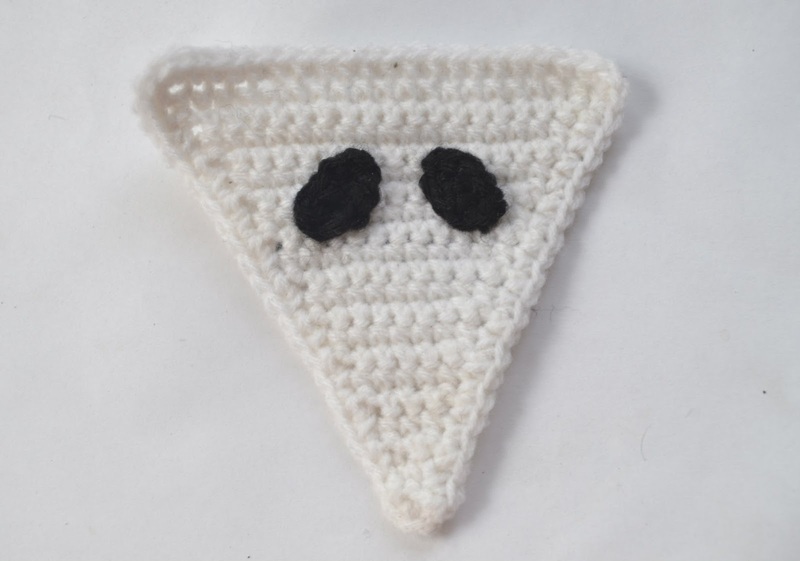 Embroider a triangle below the black part at the center as shown. Sew 2 black buttons for eyes. Embroider mouth and fangs. Follow the basic triangle pattern using black. Sew 2 white buttons for eyes and embroider mouth and fangs using white thread. 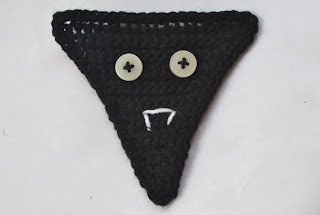 Follow the basic triangle pattern using black. Embroider webs as shown using white thread. I used black yarn in heavy worsted weight and G/4.00 mm crochet hook. 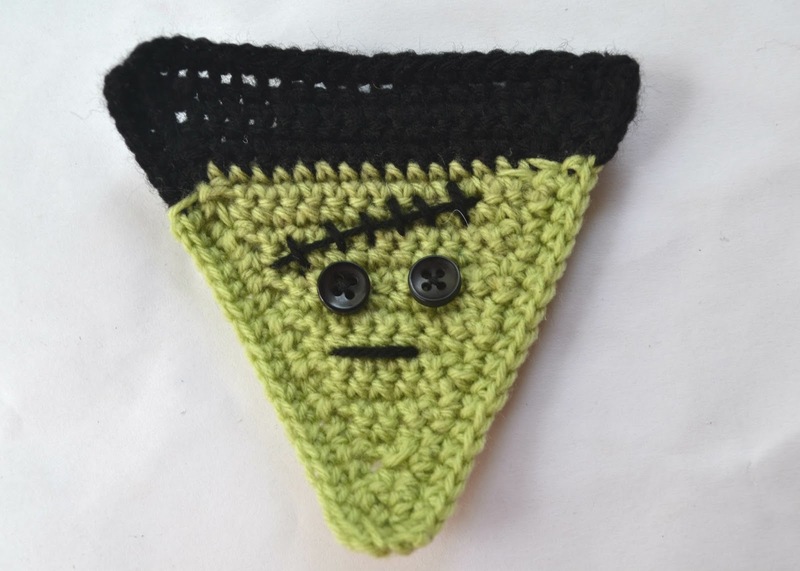 You can use any yarn and hook. Make chains long enough to accommodate all the triangles. Sew the triangles to the chains one after the other leaving about an inch between each triangle. 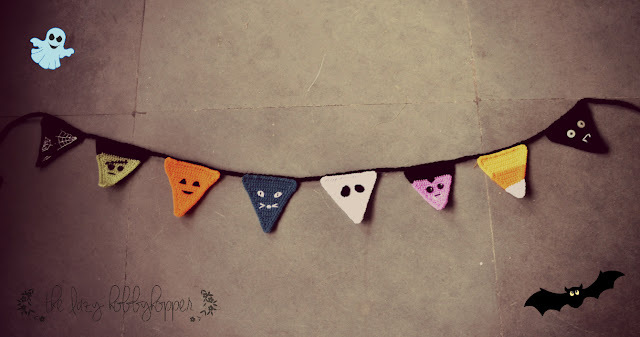 This is the cutest bunting ever! That's so awesome! Great idea! thank you for sharing. Such a great idea! You really inspired me. I'm starting right away!